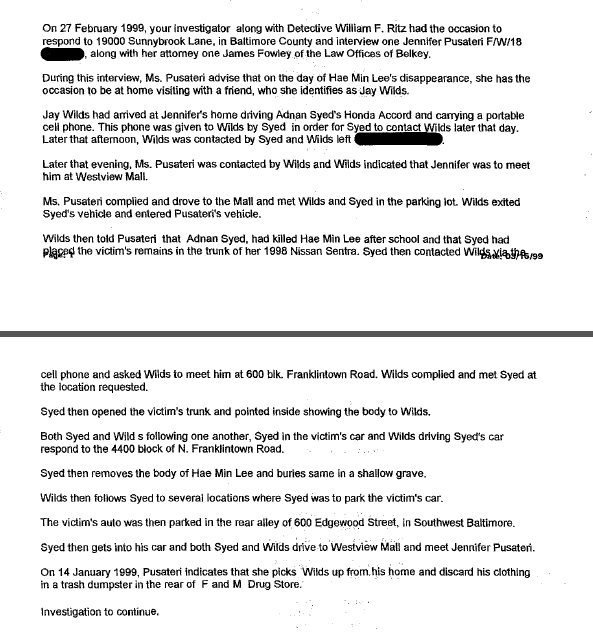 This portion is stating what Adnan did after the Leakin Park burial, but the reference to taking Hae's car "back to Edmondson Avenue" makes no sense given that there was no initial trip to Edmondson Avenue; in the "Statement of Facts" version, the trunk pop took place at Best Buy, and Edmondson Avenue doesn't come into play until after the burial. Actually, it doesn't come into play at all. Given this, it doesn't really make sense that the Statement of Facts references Edmondson Avenue at all because it's not really a meaningful signpost. Nothing occurred there, and Hae's car was merely parked 2-3 blocks away from it. Edmondson Avenue would, however, be a meaningful signpost if Hae's car were at a location directly adjacent to that avenue. So, what does all of this mean? Who knows. When the police interviewed Jenn on February 27th, did they know or have reason to believe that Hae's car was parked in the rear alley of 600 Edgewood Street? Did Jenn tell this to police? Was the car actually located there (at least at some point)? Assuming that the murder didn't actually take place at Edmondson Avenue, why was that the murder location in Jay's initial statement? And why is Edmondson Avenue still being referenced in Jay's "Statement of Facts" when it had long since been dropped from the State's narrative? I wish we had the answer to any of these questions. *If my memory serves me correctly, this issue was first raised by redditor /u/Pappy_John. Could this lend some credence to Jay's story? Did Jay tell Jenn about Best Market but when she tells the police she mixes it up with Best Buy. Did the police then try and massage the story and the cell tower evidence to fit into the mistaken belief that the pop trunk took place at Best Buy rather than Best Market? That progress report about the meeting with Jenn was written on 3/15, which is the same day as Jay's 2nd interview. Also, that report references both 600 Franklintown Road (the trunk pop, which happens to be right off Edmondson) and 600 Edgewood (car ditch). Perhaps they made a mistake and put 600 for both locations instead of 300 Edgewood and 600 Franklintown. That being said, the memo reads like revisionist history to me, it starts out reporting what Jenn said and then morphs into what Jay was doing. During Jay's cross-examination, didn't CG get Jay to admit that he had initially lied to the police about the location of the car? Or that he didn't take them to the correct location initially? Something like that? Perhaps it's related to that. I'd guess Edmonson Avenue came up for the same reason "a restaurant....think it was called.........McDonalds??" came up. Taptaptap. I'm so glad you brought up Jay as I have really been wanting to ask you this question...if Jay were to come out publicly now in an interview or book and say that he lied under severe pressure from the detectives (all that they were telling him...crimestoppers money...) and that he was not involved in any way, what penalty would he most likely face? (I assume for a charge of perjury.) Seems so wrong that in this case the penalty to Jay for perjury could be bigger than his penalty for accessory after the fact. OwGlyn: I can’t really see Adnan getting Hae to give him a ride to the grassy area behind Best’s Market, but I suppose anything is possible. carnotbrown: Yes, what you suggest could be a possibility. As you note, though, it’s so tough to tell because we don’t know what came from Jay, what came from Jenn, and what came from neither in those notes. Justin: Possibly. There’s a good deal of confusion over whether Jay led them to the wrong place before taking them to the car’s correct location. Jodi: Jay could potentially face no charges or murder charges. It’s impossible to say. Anon: Probably because the jurors thought it was corroborated by the cell tower pings. Why would Jenn know where Hae's car was anyway? If Jay struggled to describe its precise location to the police, then how on earth was Jenn able to describe it so precisely BEFORE Jay took police to the location? (Albeit with a wrong number – but why not say ‘somewhere off Edmondson Avenue’ or ‘I have no idea, I wasn’t there, and didn’t think it was overly relevant to ask.’ Are there any other notes from that interview? Unrelated question: In the MPIA file, the police progress report states the police subpoenaed news reports from various TV stations (e.g. p58 lotus notes version) – why would they do that? And why, therefore, did they not subpoena the channel 36 report of Hae, given how helpful it could have been in dating Hae’s final movements? (Was it definitely Channel 36 – because the interview with the clock etc. is displayed here on ABC channel 2 http://www.abc2news.com/who-was-hae-min-lee - and this was one of the agencies subpoenaed – so I’m guessing the original report should exist). To Cupcake's point above, Is it common in a summary of an interview for the police to put in an address, instead of what the interviewee actually said? It seems odd that Jenn would give specific "blocks" like that. It's just not how people talk. You might give an address, or a cross street, or a landmark. But I've never heard anyone say "meet me at the 4400 block of Main Street"? Maybe this is a common thing to see in a police summary? Strange wording. Scratch my first question - in the actual transcript Jenn says she doesn't know where the car is, and that Jay hadn't said anything about its location to her either. The progress report doesn't seem to represent the actual content of what was said. That is weird that there's a "Best Market" at that location and it sounds similar to best buy. Any idea if Best market was there in 1999? Also, if the murder occurred near edmondson avenue and Hae's body was put in the trunk to be buried later, why on earth would they drive back to near the murder site to ditch the car?? That's too stupid even for novice murderers. The dump site only makes sense if the murder happened near there and Hae's body was transported to Leakin Park some other way. Then the murdered would have to drive the car to the dump site and walk back to the murder site (assuming he didn't have a helpful accomplice like Jay on call). OwGlyn - Best Market becomes Best Buy? We already know how often things are twisted to fit, that don't fit. Why not Best Market is Best Buy, because Best Buy is closer to the school? Dan- what if Hae went there to meet up with the murderer, they argue, he kills her, puts her in the trunk of his car. Then he parks her car close by so he doesn't have to walk very far. He's freaked out so he doesn't know what to do and finally buries her at Leakin park around midnight with or without help from his mother. Cupcake: I don’t think Jenn knew the car’s location, and she said as much in her interview. Therefore, unless that “600 Edmondson Avenue” reference wasn’t a mistake, that information likely came from law enforcement. Also, it seems like the police were trying to get information about the timing of Hae’s interview because they themselves had questions about whether it was done on 1/13. Sassy: From the police reports I’ve read, this would be odd. Of course, we don’t know what, if anything, Jenn actually said. Dan and boo: I believe the Best’s Market was there in 1999. The Best Buy/Best’s Market thing is odd. As a resident of Baltimore I would only add that Edmondson Ave is a major landmark rd if you are trying to paint a picture of the general area. That is my only rationale for why police mention it. And being from the same age group as these people Hae being a young Korean girl would have never been in that area. Adnan is unlikely as well to be honest. Back in 1999 you didn't see races other than black American in this area unless they were trying to score hard drugs. Best Mart/Best Buy is an interesting concept but Colin can confirm for us if the "come get me call" came from 410944 or 410655 (Woodlawn) number as opposed to a 410566 or 410788 (edmondson) number that doesn't fit. Back then you could know what area a land line call came from by the 3 digit exchange. Ritz: Before during the interview prior to turning the tape on, you stated to Detective MacGillivary and myself that you would be willing to take us out and show us where the vehicle is parked. Ritz: Are you still willing to do that? MacG: Also you can show us where ah initially that day you met up with him on Edmonson Avenue? Wilds: It's only four blocks down from the car is. Cathy - other than the part about the murderer putting Hae's body in his trunk (which the lividity doesn't support) you may have a valid theory. The murderer would only need a secure or out of the way place to keep her body until the middle of the night when he could take her to Leakin park. Also since no evidence exists that Hae's body was in the trunk of her own car (which would help the state's narrative so if there were any smoking gun they would have presented it) I suspect she was transported in another vehicle. Not Adnan's car either. But who could she have been going to meet down there? It would have to be someone important enough to risk being late to Campfield and that couldn't have waited until after she picked up her cousin. I have a hunch about why that location fits but don't want to post it publicly. Just occurred to me that in the states version of the crime, in a public place, Best Buy parking lot, broad daylight, Adnan lifted a body from the cabin of the car and placed it in the trunk. Dan- If you see this, and don't mind, could you email me you hunch about how the location fits with Hae meeting somebody? I would love to mull it over as it is something I am unable to put forward a hypothesis. email me at new_account8@hotmail.com if you don't mind. This is probably off the topic a little but it does have to do with Jay's Plea Agreement from September. Has anyone brought up or explained why The Terms and Conditions on page 1 end with the letter "d" and the top of page 2 begins with "h"? What happened to terms and conditions e, f, and g? I know it could have been an error but that with Urick signing as the ASA for the Baltimore City Narcotics Unit when there were no terms or conditions that would appear to pertain to narcotics seems strange. Probably nothing worth mentioning but it has been bothering me for a while.